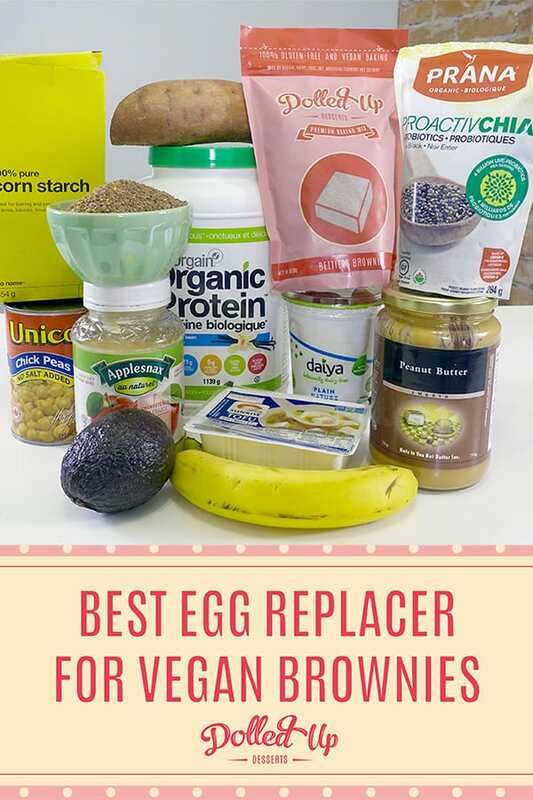 We tried 12 different egg substitutes for our vegan brownies. What we discovered changed the way we look at baking, FOREVER. There is a lot of information on the internet about which egg replacer to use for brownies, none of which provide clarity or are helpful in the slightest sense. Consider this your ultimate guide to vegan eggs in baking brownies! The internet is full of recommendations on how to veganize a recipe. When it comes to eggs, it is essential to know what “replacer” to use when, since each egg substitute acts drastically different in each recipe. And can we really trust everyone on the internet writing about these egg replacers? Have they actually used them on the day to day to create high quality and SELLABLE baked goods? The answer is probably not. 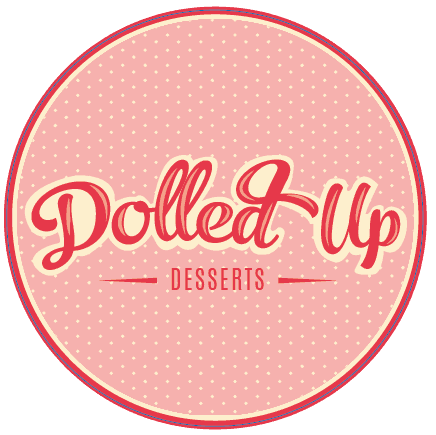 That’s where the official Dolled Up Desserts ranking comes in. 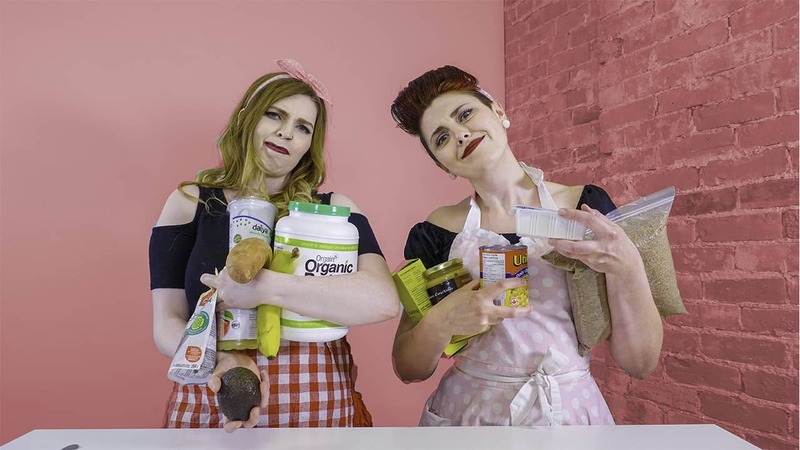 We tried the Internets most searched egg substitutes with our Bettie’s Brownie Mix. Watch to see what happened. Read on to get the run down on each replacer. Peanut butter comes dead last and is a DO NOT EVER USE egg replacer. Although the duo of chocolate brownies and peanut butter sounds appetizing (check out our recipe for Peanut Butter Cup Brownies), using it as an egg replacement ended with a deep fried brownie sand that just tasted horrendous. If you must use peanut butter as an egg replacer, remove at least 75% of the oil in the brownie, and hopefully, it won’t deep fry. This egg replacer is on every vegan blog imaginable. DO NOT USE IT, FOR ANYTHING OTHER THAN BANANA BREAD! It provides no benefit to the texture or structure of the brownie, and it just ends up tasting like roasted and rotten bananas. It overpowers the chocolate and fudginess of the brownie, so overall we would not ever use this. Ever. Unless you like the taste of roasted avocado and chocolate, I would not recommend the use of avocado egg replacers either. It did not add anything to texture or stability, and the brownie was still a crumbly mess. Although the unpleasant coating of corn starch lines your mouth, this egg replacer is moderately better than any of the previously listed. It added a slight chew that was unique and the flavour was not as overpowering as the banana or avocado, but it did not support in the brownie structure or stability. It made it drier in fact. Aquafaba is one of those shiny unicorn egg replacers that has us all seeing stars (including ourselves). It whips up like a dream and is fantastic in mousses, meringues and as a chiffon cake, but it is terrible in brownies. It added nothing to make the brownie more cakey as predicted, and just left us with the taste of chick peas. Gross. We disagreed on the ranking of this egg replacer. It provided a lovely and moist fudginess to the brownie, while helping maintain a more stable and less crumbly texture. However, there was an apparent omega-3 taste that ruined the brownies balance of flavours. In addition, although the fudginess was great compared to the previous terrible egg replacements, it was almost too fudgy and stuck to the roof of your mouth. Tofu is a strange thing to find in a brownie, but it did provide a fudgy brownie like texture, moisture and mild taste that did not take away from the brownie. It was good, but nowhere near our first choice. This brownie was hands down the most moist and fudgy. Apple sauce added some fantastic hold and stability to the brownie. But what landed it in 5th place was the flavour. It tasted like APPLES! Do we want a brownie or this weird chocolate apple bar thing? Vegan protein powder is what we would recommend if you were in a pinch. It provided some extra moisture and hold because it is protein (this is what protein does in an egg). Ours was vanilla flavoured and so it added a taste that was likened to Chocolate Chex or Oreos. It was chocolate with a hint of this fake vanilla like flavour. Overall it was passable, but not our first choice. We used Daiya’s Vanilla Greek Yogurt for this trial, and it stood out significantly. It added a mild vanilla taste that was better than the protein powder, a lovely level of moisture and fudginess as well as hold. This was probably due to the extra structure provided thanks to the protein in the yogurt. It was overall a good replacement in brownies. Milled flax seed and water is the standard egg substitute in brownies. There are small dried out water soluble protiens in the shell of the flax seed that when bound to water, create a matrix between other seeds that to the eye makes a goopy, white like texture. This goop is full of protein, fiber and moisture that helps keep the brownie all together. On top of that, milled flax seed has no flavour unless it is rancid, making it the ideal choice to balance brownie flavours. Last, flax seeds are highly accessible, affordable and do not require a lot of extra work to put it to use, making baking with them the simplest. However, what put this amazing egg substitute in second was the fact that the seeds get stuck in your teeth. To someone who is not used to it, it can be pretty unnerving. To our surprise, sweet potato is the best egg substitute we have ever had. Moisture: this brownies was the perfect amount of moist and fudgy (unlike the apple sauce), due to the moistened fibers of the sweet potato dispersed throughout the brownie. It was like the fudgy brownies with all the sugar in them (as sugar makes things fudgy) but without all the sugar. Texture: this brownie had a fantastic brownie texture that made it feel like it was not gluten free or vegan at all. Flavour: the sweet potato did not take away from the chocolate, and added a slight sweetness of its own that accentuated the sugars of the brownie. Structure: the brownie cut well, was not crumbly, and overall held its own despite being gluten free. Overall: 10/10, would use for all brownies in the future! Only downside: it takes TIME to peel and boil potatoes. If you are tight on time, use flax seed. But if you are on the quest to make the best brownies or fudgy bar like treats ever, take the time and use a sweet potato. You won’t regret it. Okay this is great and really helpful BUT how much did you use of the yoghurt per egg? It is 1/4 of a cup per egg! Do you think using unsweetened applesauce would make it better? It all depends on what you think is “better”. We thought it was sweeter but too fluffy for a brownie that we like. Thank you so much for this comprehensive review. I made a double batch of boxed mix subbing in applesauce for half of the eggs and milled chia seeds for the other half. The brownies have a lovely texture but slightly apple fishy (omega) taste that is decidedly not too delicious. I have one box left and swung by the store to pick up a sweet potato. I’m going to see if I can prick it all over and nuke that bad boy in the microwave instead of boiling it. I’ve never seen this as a suggestion but it makes perfect sense. Thank you! Sweet potato is a great egg replacement! We use it all the time. We really dislike the applesauce and agree it has a funny taste. Good luck with the microwave… never done it before but if it can be done with a plain potato I’m sure sweet is no different! My boxed gluten free brownie mix calls for 3 eggs. Would I use 1/3 cup total mashed sweet potato or a whole cup (1/3 cup per egg)? one cup seems like a lot. It is a lot! But 3 eggs also provides a lot of moisture. I would do at least 3/4 of a cup if not a full cup! What if you siffed the flax seed after the googy part forms? For what reason? To just get the protein rich glue that comes from the flax? This is a fabulous list. I will try the sweet potato brownies…..I have not been happy with any of the other substitutes for eggs. They really are quite good for making your brownies moist and fudgy. I hope it works for you!